Two penguins walk into a bar ... Wait! Wrong joke. However penguins do walk, and have feet, but (for cartoon penguins, at least) can't see their own feet. How do they know they have them? Faith! Faith in the unseen. 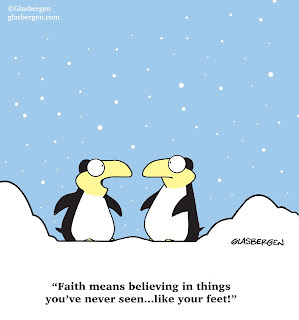 The person who sent me this cartoon intended penguin faith-in-feet to be a telling analogy: People have faith in God even though they can't see Him. Some things can't be seen directly and just have to be taken on faith. Thus we find our way to simple truths by simple analogy. But maybe not. If we take this (bad, it turns out) analogy at face value, we can easily see that the penguins' faith is well justified (as some kinds of faith certainly are), but the faith of the believer in God, which I claim is belief without evidence, is not. A cartoon penguin can rightly and without embarrassment say he has "faith" that he has feet, even though he's never actually seen them. How so? For one thing, he can point out that something is providing his locomotion across dry land, and feet are the most sensible hypothesis. Indeed, the waddling stepwise sensation he experiences while moving about is more in line with feet than, say, wheels. You'd be surprised at how well penguins reason. Further, the two penguins in the cartoon might hit upon the idea of examining each other for the existence of feet. "You have feet," says one. "So do you," says the other. More generally, a penguin who has seen feet on every fellow penguin he's ever looked at can justifiably take it on "faith" that he himself has feet, even if nobody actually told him he does. A scientist-penguin might even devise an experiment where he is able to see his own feet in a reflecting pool of water. These are all examples of how we (and cartoon penguins!) apply reason and empiricism to learn about reality. Some things that are arguably real can't be seen directly (such as atoms), but can nevertheless be taken (once the necessary investigations have been done) on "faith," and rightly so. The difference is that faith in these things is backed by some kind of actual evidence that is sufficiently strong, whereas faith in God is not. Faith in God is truly blind faith: the belief in something that can't be proved or even strongly inferred. (The universe is not evidence of God; it's evidence of the universe. To say more than that is to overplay your hand. Unfortunately, we don't have time to argue about that here.) Alas, there is no virtue in believing things on insufficient evidence, and what God who gifted his creatures with rational minds would want it to be otherwise? But you can certainly understand why religions have tried to make it a virtue, because their existence depends upon it. When you believe in made-up things, your belief becomes arbitrary. And why not? When you're allowed to believe anything you want, with no empirical grounding, then there are no universal authorities to which everybody can refer to resolve disagreements, so "arbitrary" is what you end up with. Thus believers tend overwhelmingly to believe (occasionally with minor variations) in the God of their parents, which is almost as arbitrary as any belief system can be, because belief then becomes something you're born into, not something you judge to be true by examining evidence. The indoctrination is well nigh complete before you reach the age of reason, and then you're stuck. (A friend once remarked that the "escape velocity" of religion is high.) Parents are equally unmoored: they believe what their parents believed, and so on working backward. Regardless of how much one admires one's parents, that can't be a basis for discerning truth. But absent evidence that everybody can examine and (through the application of reason) acknowledge, there cannot be a universal authority, so anything goes. Thus we have faith that really is "blind," which is to say ignorant. It is fascinating too that all believers have high confidence that they personally (lucky them; and there's nothing more arbitrary than luck!) are correct, even when the myriad beliefs in circulation profoundly contradict each other. That Muslim, Hindu, Sikh, whatever, is as sure of himself as you are, and with just as little actual evidence. What a mess. And so believers argue among themselves, trying to persuade their opponents to somehow, irrationally, find their way (have faith!) to whatever arbitrary position is being defended. The answer, you see, is to just believe, and by "just" we mean I should believe what you believe, and for no better reason than that you believe it. The penguins, who at least require a little evidence, would be appalled! A cute cartoon that makes a simple but relevant point can be useful. There's explanatory strength in good analogies. 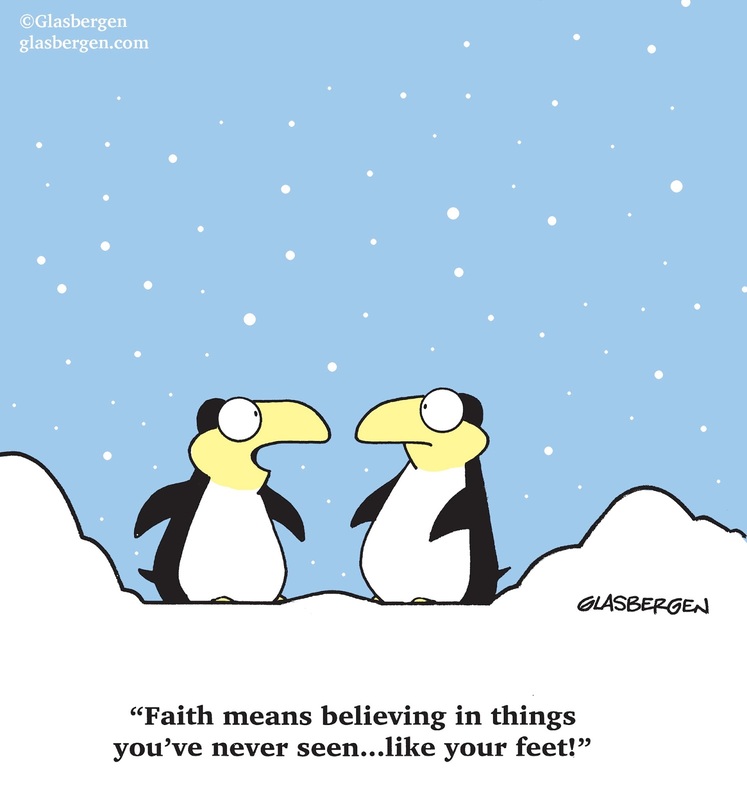 But unfortunately for religion, the penguin cartoon describes a faith-in-feet that can truly be justified, even as faith-in-God cannot be.